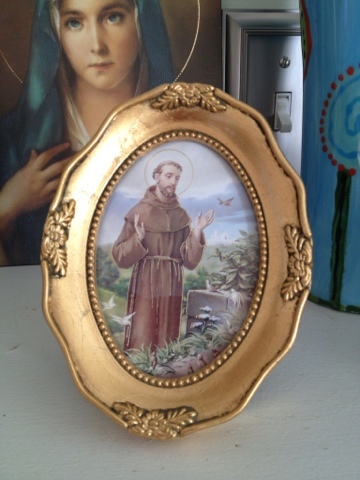 While in Colorado I happened upon this lovely picture of Saint Francis. I stepped into a second hand store and I do love them so very much, but didn't have anything in mind for purchase. I love visiting second hand stores for the unexpected finds they seem to hold. This little gem sure fit that description. I would not have found it if it were not for my toddler. She always a fan of hiding in corners knocked over a stack of framed pictures. All were small in size thank goodness because it would have been disastrous if the artwork were larger. When I went to pick up her mess I noticed by my toe this lovely picture of a beloved Saint. I had to buy it. I just knew I did. So when I found out today that the Church had named its new Pope who decided to take the name Francis I had a fantastic laugh. I'd like to think I was given a hint well before the announcement had been made.